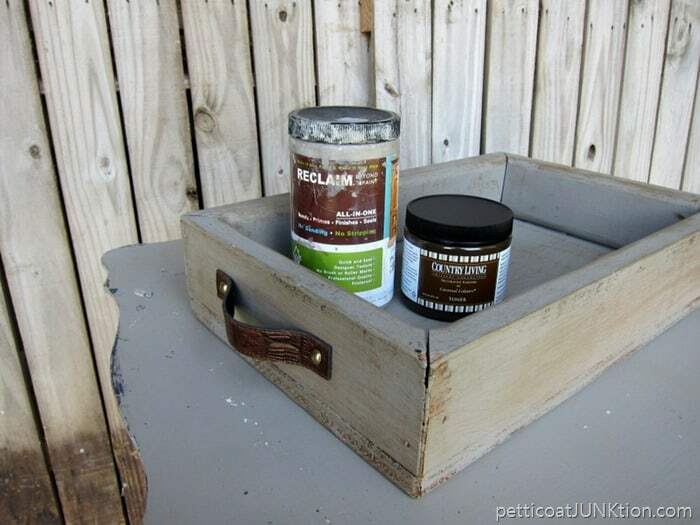 Some of you have been asking about the paint tutorial for the four trays I painted last week. Well, today is the day. 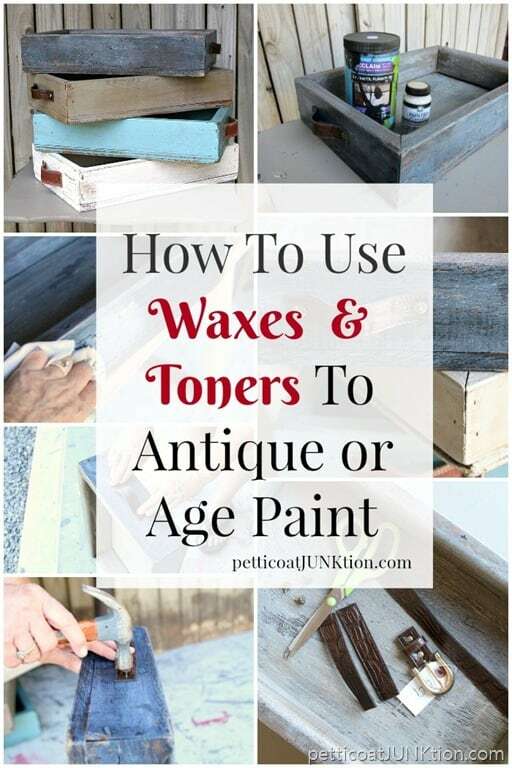 Waxes and Toners make antiquing paint really easy! 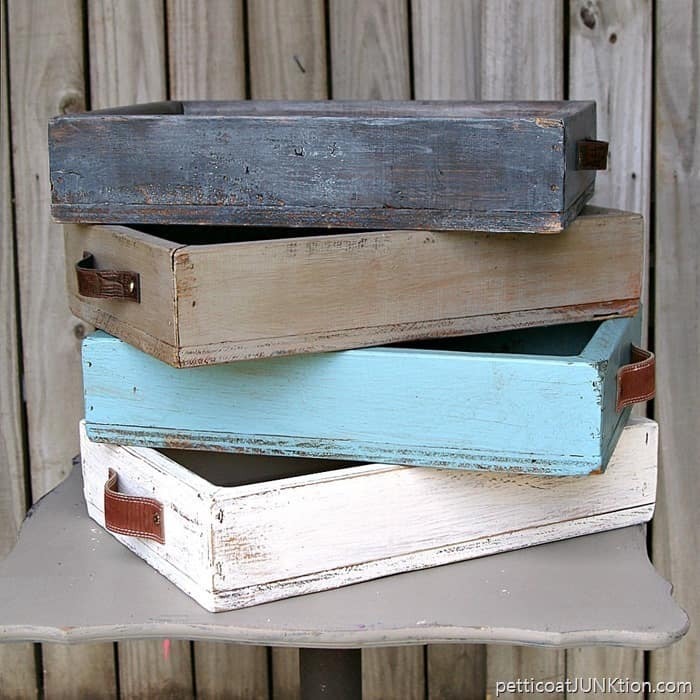 The four trays were painted different colors and then I used waxes, toners, or just sandpaper to give each of them a special finish. 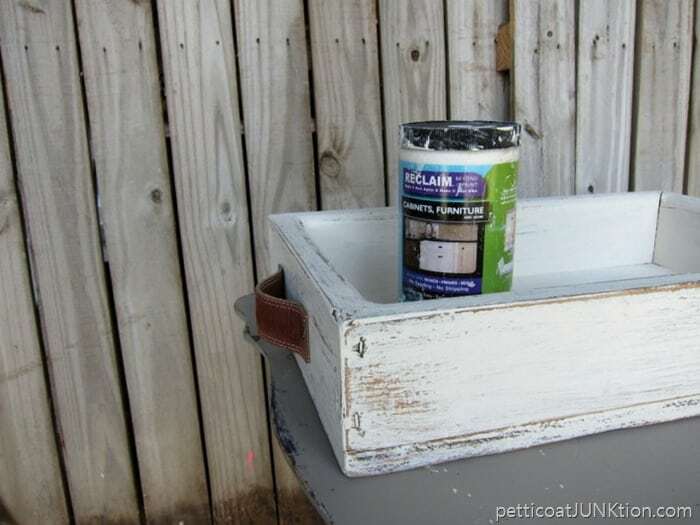 The white tray is painted with Beyond Paint in Off-White. 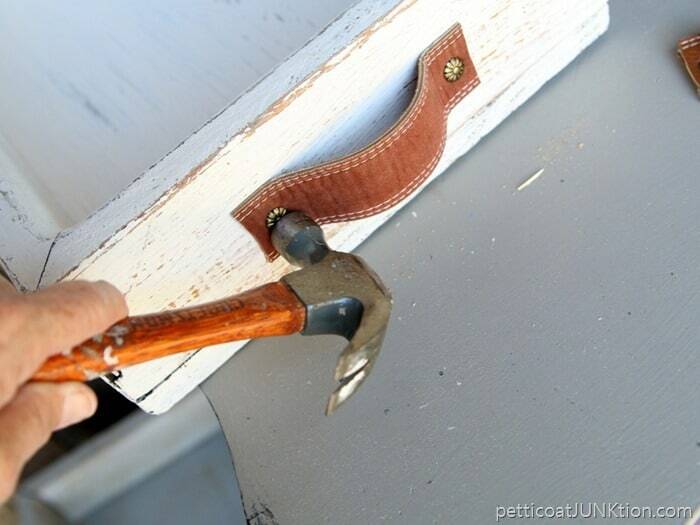 I simply distressed the paint with 100 grit sandpaper and that was it. 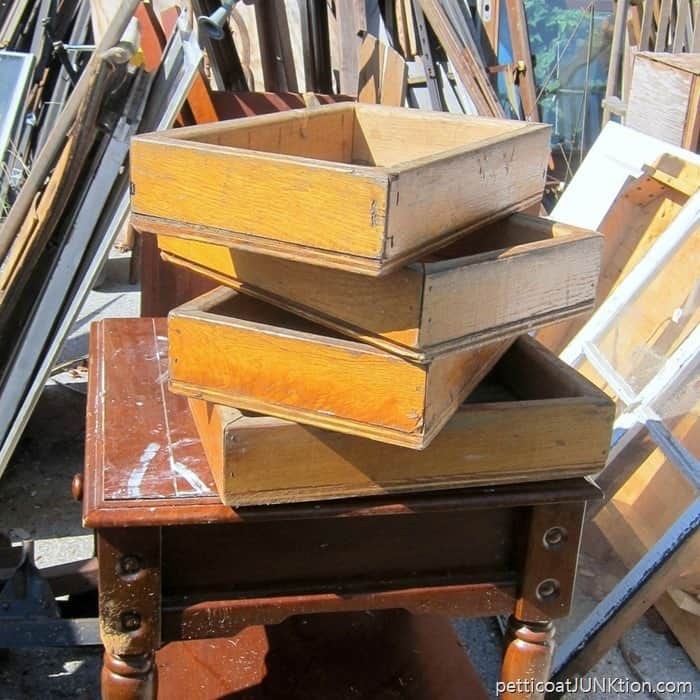 A clear wax can always be applied to add extra sheen or for protection if the tray sees heavy use. The belt is a thrift store buy. 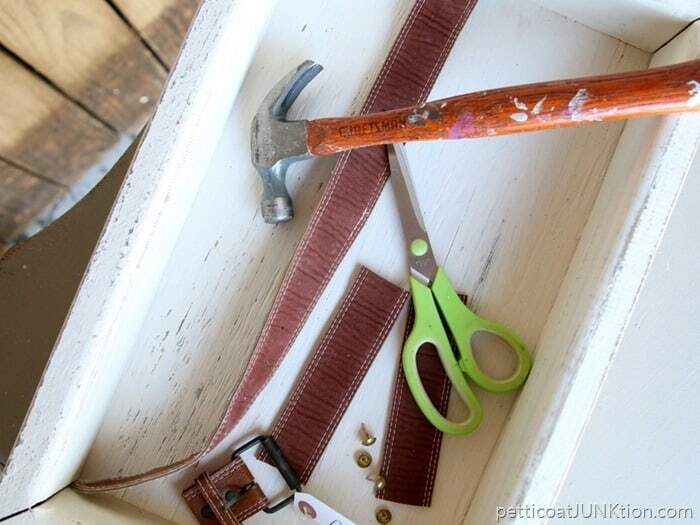 I cut the belt up to make handles. I actually used the reverse side of the belt. It had a soft finish. Not sure what the material is. 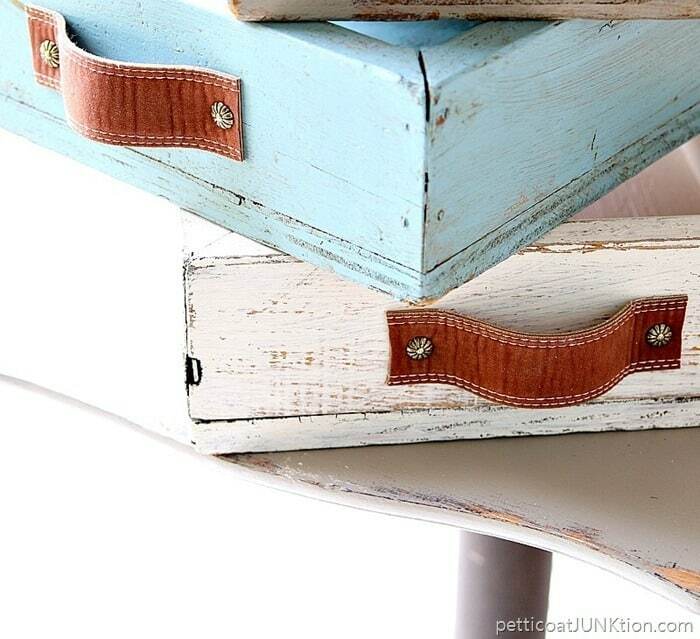 I nailed the handles on the tray using upholstery tacks. 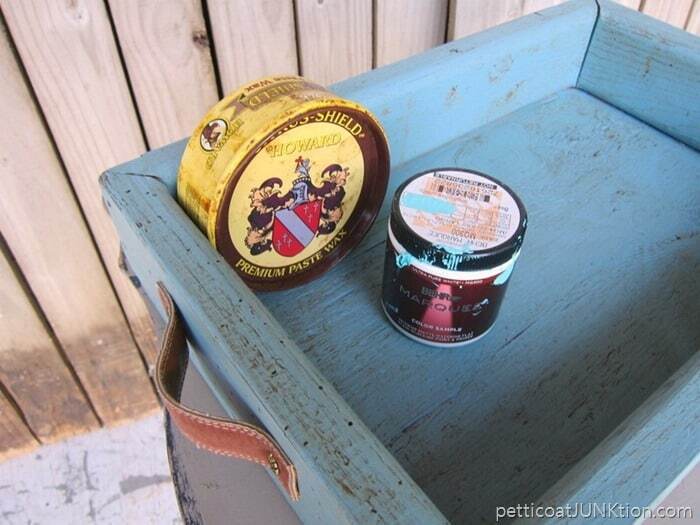 The black tray is painted inside with brown latex paint and the outside is Beyond Paint in Licorice. 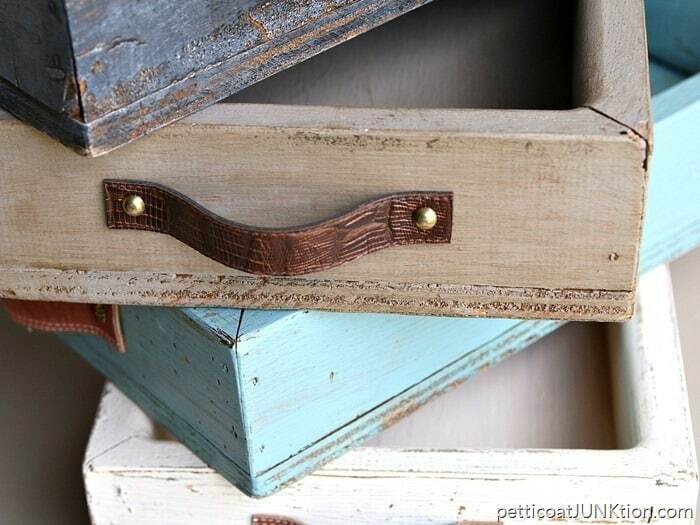 The white finish is Barnwood Wax from FolkArt. 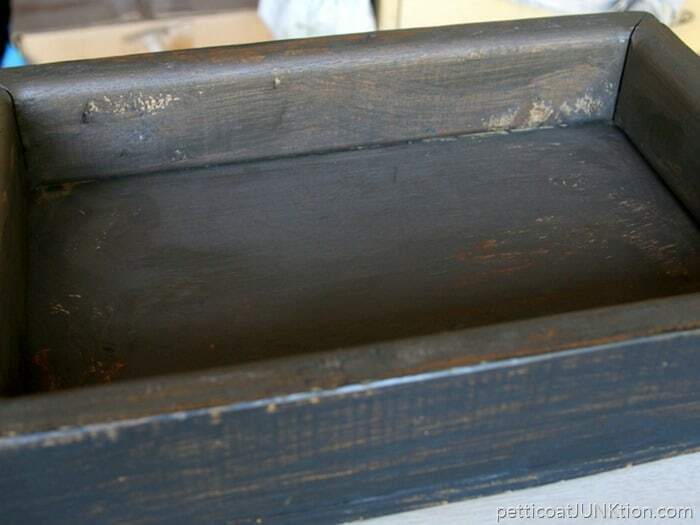 I started painting the tray brown then decided to go with black on the outside. 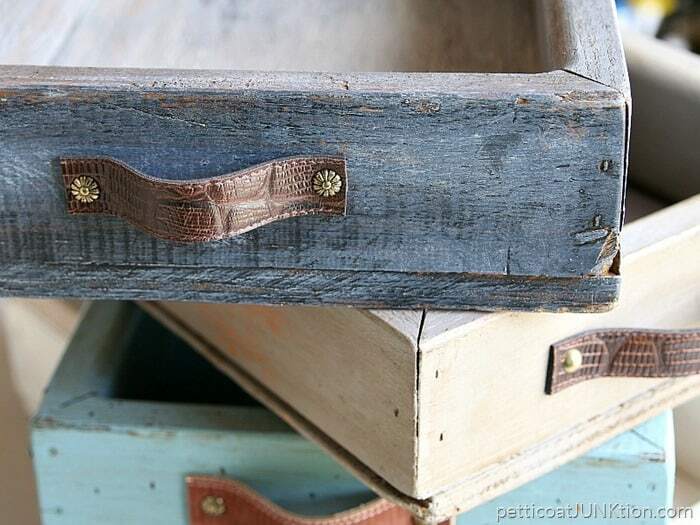 The Barnwood Wax is applied using a soft lint free cloth. I just rub it on and then rub off the excess until I get the look I want. Same process as above but a different belt. This one kind of has an alligator look. How pretty is that. All of the belts I bought were faux leather. They still look good. The day I went to the thrift store I couldn’t find any belts made of real leather. 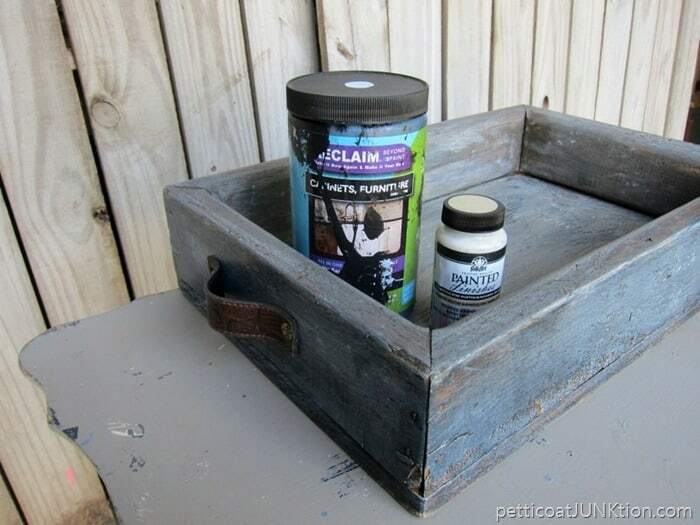 The brownish tray is painted with Beyond Paint in Pebble. This is one of my favorite colors. The Pebble is a neutral color but it has a little pizazz too. Caromal Colours Toner gives the tray an antiqued or aged look. 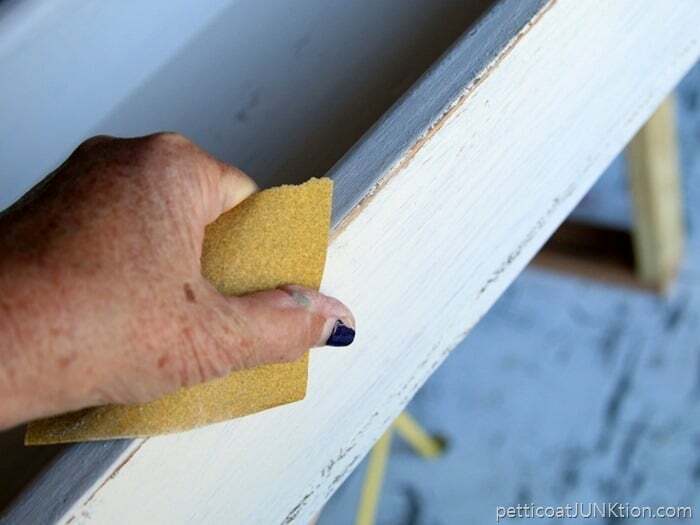 I use this product on painted furniture all the time. You just brush the toner on. 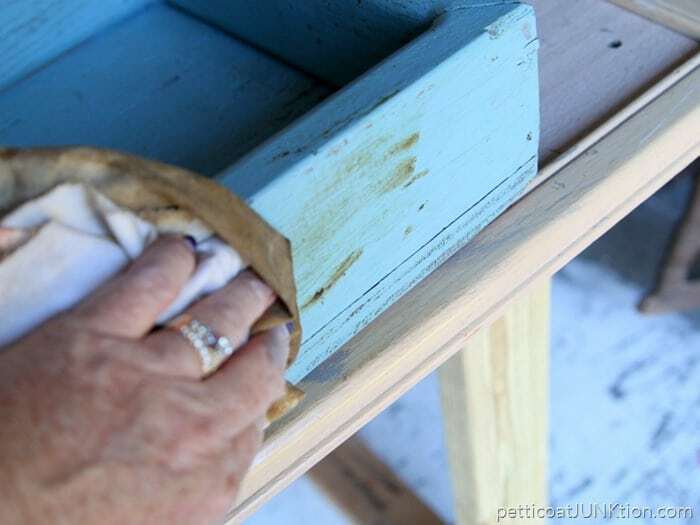 Then wipe it off with a dry or damp rag. A damp rag will remove a lot of the toner, a dry rag just the opposite. The toner goes down into the little dings and crevices in the tray. It’s best to wait until the paint has cured for several days before using wax or toner on the paint. 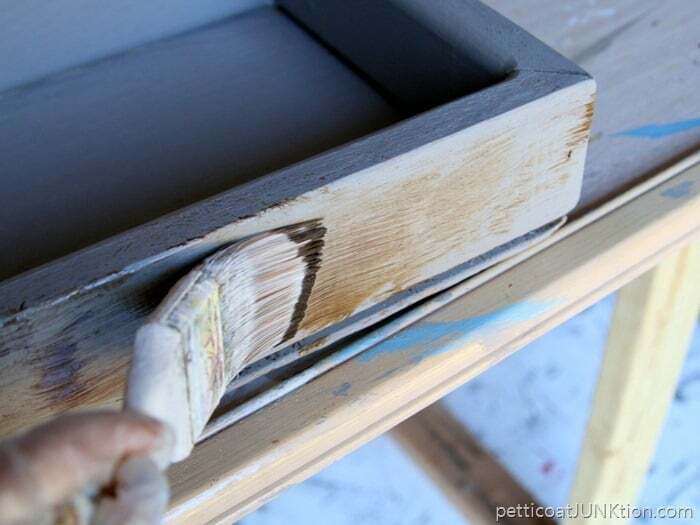 The paint may come off in places if not dried well. 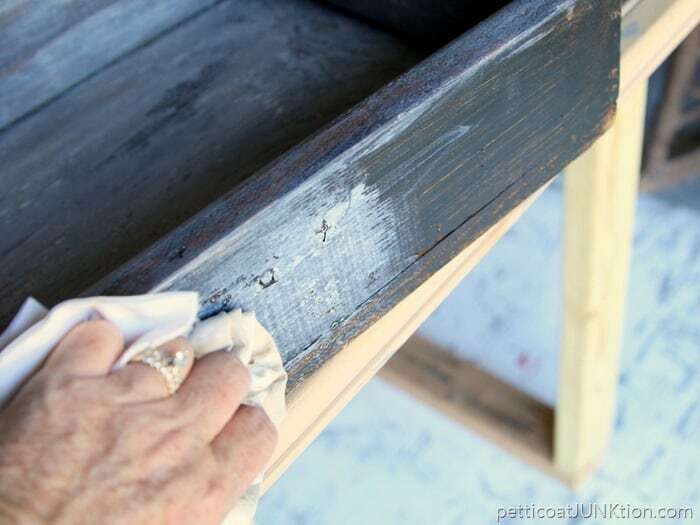 See what a difference one more step makes in the paint process. The bluish turquoise paint is an oops sample. Have to love a price of 50 cents. 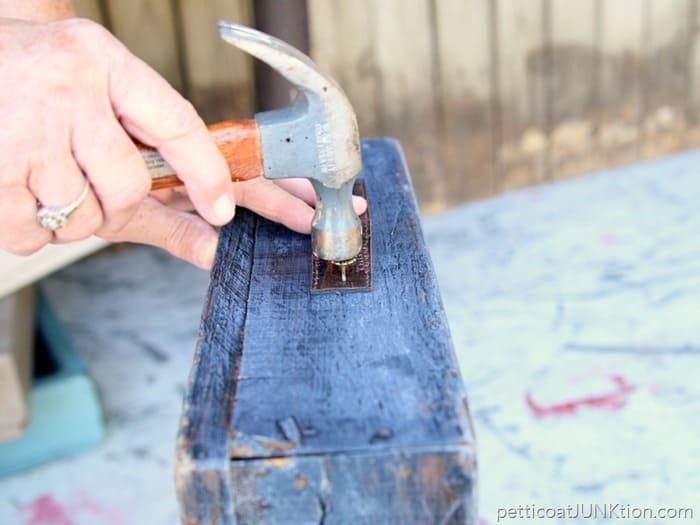 Howard’s wax in Golden Oak gives the paint an aged look. Apply the wax with a lint free cloth (old sheets work great) then 20 minutes later buff the wax with a dry rag. The wax also gathers in the dings and crevices of the tray. 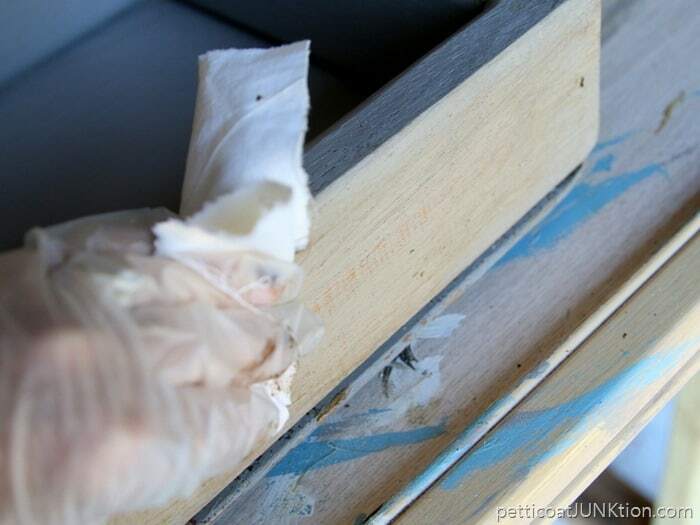 See how I took the paint projects up a notch with just a little bit of effort. I know I asked which is your favorite tray before. Now tell me which technique is your favorite or which one you would like to try. I listed the products below and all can be found on Amazon except for the Caromal Colours Toner and I have it in my Etsy shop. You can click any of the pink links below to view and read about the products. Tomorrow is wreath day. See you then. Have a great day. I love them all!!!!! I’m about to head to your favorite place Butler’s. Yea! I went up myself this afternoon! I can’t choose just one!! They’re all great!! Thanks so much! I Just love the look of all these finishes. ?? ? I have a question. I have an old chair with a rusty back that is metal. Should I sandpaper some of the rust off to make it smoother and apply a wax. What kind of wax should I use? Thanks. 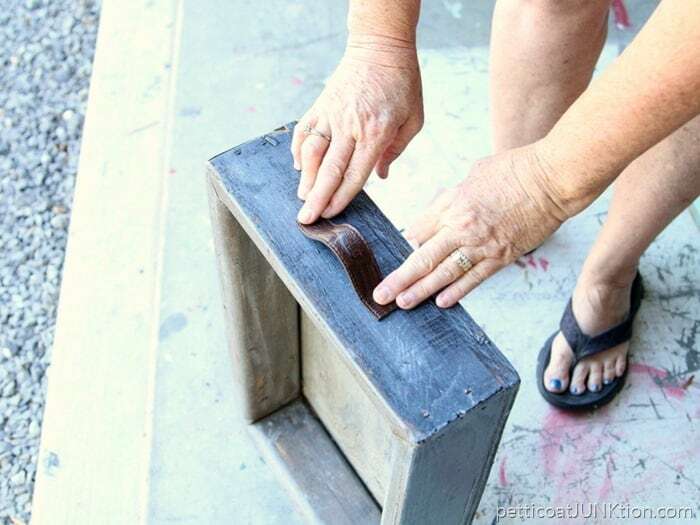 I’ve never sanded the rust off of metal but sounds good to me. I like Howard’s Wax and it’s relatively inexpensive compared to some. You can find it on Amazon or a lot of the antique/flea market shops carry it. Hope this helps Effie.